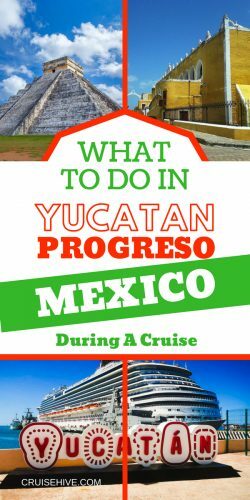 Find out what you can do when the cruise ship visits Progreso, Mexico. A cruise vacation destination in Yucatan with a lot of Mayan history. On shorter western Caribbean cruise itineraries, you are bound to come across Progreso, Mexico. 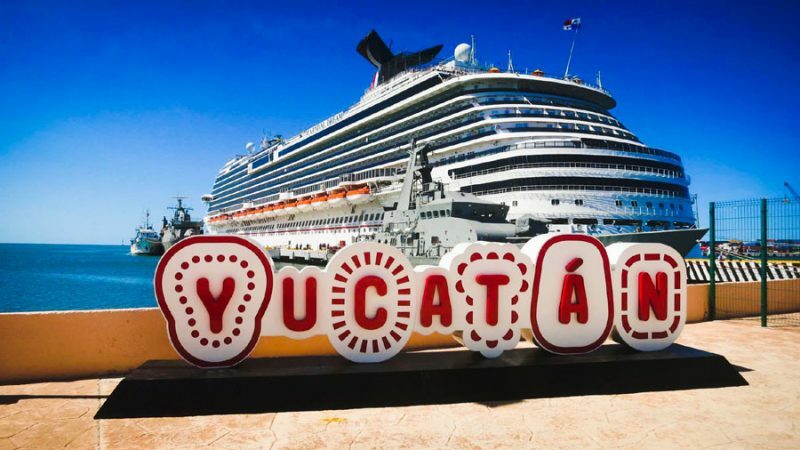 A cruise port located in the Yucatan state in the Gulf of Mexico. Whether your interest in the place is as a winter escape or you happen to be passing by it through your cruise. You will be glad that you visited this beautiful, historically rich, authentic Mexican port. Unlike meticulously developed private cruise ports that are common nowadays, Progreso is a real cruise port. That offers you an insight into the daily life of its dwellers. It takes you to some of the most famous Mayan ruins. Offers you a new experience like swimming in the natural pools known as Cenotes that are common in the Yucatan Peninsula. This little port, famous for the longest pier in the world, about 6.5 kilometers, over 4 miles long. Features a fascinating combination of different exotic experiences. From white sandy beaches to historical colonial towns, not forgetting natural pools and of course the mesmerizing Mayan ruins. You are guaranteed to have fun while visiting this port. Once you get off the ship, you will find free shuttle buses waiting to take you through the long pier to the port and into Merida town. At the port, you will be welcomed into the market area, where they sell colorful t-shirts, bags, jewelry and even handcrafted Mayan figurines. Browse all of these cruise accessories before your cruise to Progreso, Mexico. The port features a long Melacon with a beachfront. There are plenty of seaside restaurants, bars, and water equipment rental shops at this place. If you don’t feel like venturing inland into the island, taking a day off at this port is also enjoyable. Go to the beach and grab any one of the many beach chairs available and relax under the sun all day long. Indulge in the beachside massages offered from $10 to $35 an hour. Mind you this is not the only beach you could visit at this port. If you book a beach excursion with your cruise or a reputable tour operator. You will be taken to a private beach resort further north of the island to smaller towns where you can enjoy a more private experience away from the crowds. The sun in Progreso is pretty hot, you will be drinking lots of liquids. So, grab a cold margarita, a daiquiri or even a Cerveza a popular Mexican drink at any one of the bars on the beach, such as the popular Eladios. To keep cool and hydrated. The bars are strategically located to give you a nice view of the beach, as you relax and enjoy the sea breeze away from the heat of the island. Progreso beach is not all that glorious if you compare it to the usual Caribbean beaches. So, if murky waters and crowded beaches don’t interest you. Then a visit to the nearby town will more than make up for your lost beach day. Located 30 minutes away from Progreso is the town of Merida. The capital city of the Yucatan state. Enjoy the bustling energy that radiates from this beautiful historical city. Go sightseeing and experience the colonial town in all its splendor. You can do this through guided excursions, or DIY excursions. The busiest place in the city is Plaza grande the City’s square, which hosts a number of historically significant ancient buildings such as the San Adelfonso Cathedral, built in the 15th century. Make sure you have your travel gear from Amazon when you visit these places. There are plenty of food places and shopping areas in this part of the town. You can indulge in an authentic Mexican shopping experience. Grabbing their authentically handcrafted Mayan figurines, t-shirts, sunglasses, cheap trinkets and jewelry to remember the place by. Wander further downtown to explore the beautiful Paseo de Montejo Avenue. The stunning boulevard is lined by trees and features beautiful colonial French mansions. The architectural beauty exuded by the carved wooden doors, beautifully sculpted roof edges, pillars and balconies is a sight to behold. The white color of the buildings sparkles in the Mexican sun. The color is attributed to the limestone used to build houses on this island. Giving the place the name La Ciudad Blanca, meaning the white city. Some of the excursions offered that feature touring this city also include a tour of The Grand Mayan museum. Where you experience a firsthand view of Merida’s historical past. And explore artifacts retrieved from the Mayan ruins during the excavations. Such as the famous seven dolls, figurines, excavated at the Dzibilchaltun ruins. While at the museum visit the gift shop for more authentic souvenirs. Or grab lunch at the cafeteria if all that walking works up an appetite. Enjoy a real authentic Mexican shopping experience in Progreso. Once you get off the port, the shuttle will take you to Merida town 30 minutes away, where there are more shopping stores. Bring you’re A game in bargaining to walk away with beautiful Mexican bracelets, jewelry, t-shirts or handmade Mayan artifacts. Carry cash as some of these shops do not take credit cards. Get all your Mexican souvenirs from Amazon right here. To the North of Merida town is the Dzibilchaltun ruins. which was once a major Mayan city. At these ruins, you will get to explore the temple of the seven dolls and learn about ancient Mayan civilization and their religious practices. Go for a dip in the Xcalah Cenote, located at the center of the ruins site. It is a natural pool formed from holes in limestone rock which filled with water over time. The cenote at Dzibilchaltun used to be a sacred place but is now used as a swimming pool by tourists and the locals. For those fascinated by underwater life, you might sight some small fishes and underwater plantation in the Cenote. It’s such a breathtaking place, you will enjoy visiting the place. If you can’t get enough of the mystery that is the Mayan civilization. Then you will want to visit bigger, better Mayan ruins sites located deeper into the island. To get to these ruins, you will need to take 1-2-hour bus/taxi rides further north into the island. To start with there is the Uxmal Mayan city ruins, located in the mountain ranges an hour away. Explore Mayan architecture depicted by the Temple of The Magician and The Governor’s Palace found at the place. You can either take the highway to this place and exit at the Mayan ruins exit or take the more scenic old dirt road that goes through quaint little Mayan villages, for a richer experience. However, if visiting the port via a cruise, the 6hours available to explore the island might limit you from taking this route. When exploring the Mayan ruins you will need insect repellant. The largest, most stunning and also the most important Mayan ruins in the Yucatan peninsula is the Chichen Itza ruin. Located 2 hours away and a good 160 km from Progreso in the heart of the Mayan Jungle is the ruins. These ruins feature the Kukulcan pyramid, which stands 100 feet above the ground with 365 steep steps to the top representing the Mayan Calendar. The ruins also feature a ball court which is the largest in Mesoamerica. Visit the place and learn interesting facts about the game that surprisingly involved a lot of bloodshed. As it said that, losers in a ball game at this court, would get sacrificed to the Mayan gods. 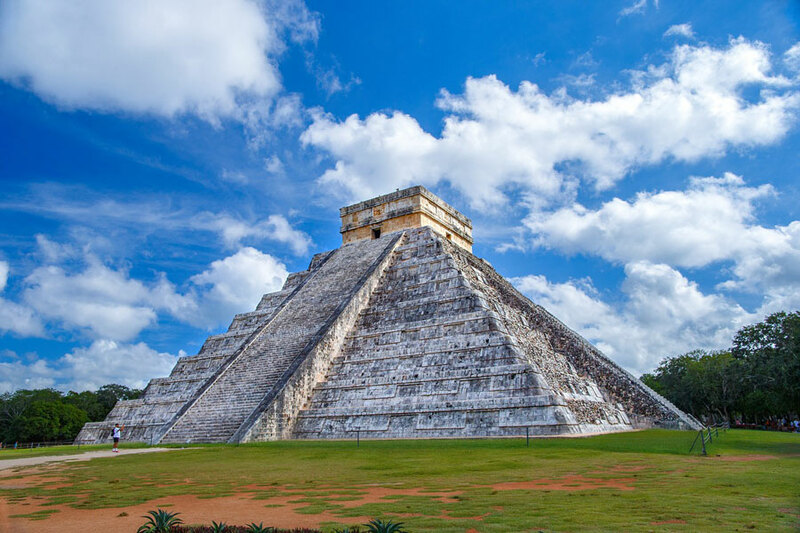 You will also get to visit the oval observatory, which was used by the Mayans, to study astronomy which is very intertwined with their culture and history. All in all, at the end of the day, you will have learned quite a lot from this mysterious place and will have a deeper understanding as to why it’s considered among the 7 wonders of the world. Located south of Merida and about a one-and-a-half-hour drive away is Calestun. Another beautiful quiet Yucatan town. For those of you who would love to visit the pink flamingos and the bird sanctuary, then this is the place to go. To get here, you will either take a taxi or a rental car from Merida. If you are not good in Spanish, it’s best to take a taxi and a local guide. The guide will show you to the best spots in Calestun, some of which you wouldn’t know to visit by yourself. Along the way to Calestun is Uaymitun which is the most frequented spot by the pink flamingos. Once in Calestun, you will take a boat ride to the large lagoon, where you can see the flamingoes in all their beauty. It’s in this town that you can visit other beautiful non-crowded Cenotes. That feature beautiful blue clear waters, that you can jump in to and cool off from the glaring Yucatan sun. Another place to visit while in this town, are the large pink salt Salinas. Where you will get fresh large salt particles as a souvenir. Among the thousands of cenotes found in the Yucatan Peninsula is the famous Cuzama cenotes. Book a trip to these natural pools either via your cruise or reputable local tour operators like Bill Lawson, and the Yucatan Cenote Eco Aventura team. This magical place is located 48 km from Merida, about an hour drive away via the highway. Once you set off on the highway, you will come to a place called Acanceh, where you will exit off the highway. You will then go through the town to reach underground cenotes site. Find your swimwear from Amazon right here. Jump from a platform, swim or float in these beautiful pools, found in the quiet, tranquil scenic heart of the Mayan forests in the town. Carry a flashlight, scuba gear, and a good waterproof camera, to enjoy a great dive hundreds of feet deep into these natural pools. Explore the formation of the caves, even the fishes that live in them and leave with a memorable diving experience. Take a kayak tour of the island’s beautiful mangroves. Here is where you will get to learn more about the flora and fauna of the place. The mangrove waterway is located at Ria. Expect to explore different bird life while snaking through the narrow estuaries of the mangrove that are lined by the petrified mangrove forest on either side. The tranquility and natural beauty of the place will leave you well relaxed. Making the trip worth the $67 per person paid for it. 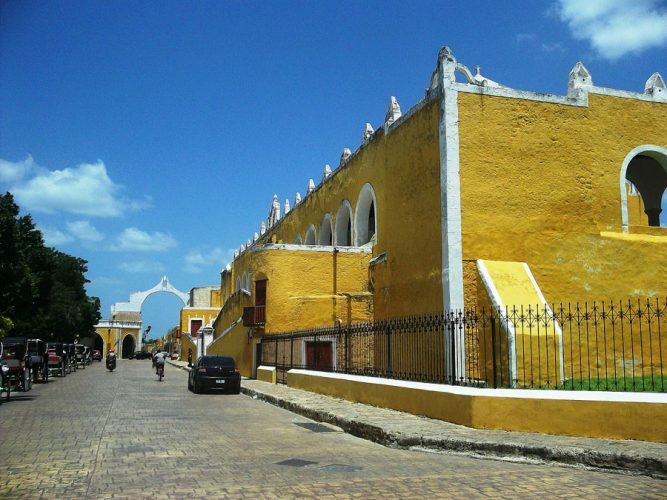 Known as the yellow city, Izmal town is the oldest colonial city in the Yucatan. Its houses are painted yellow, giving the city the name “Yellow city”. Izmal is also called the city of hills, as its located amid hills believed to cover more Mayan temples. Located roughly 40 miles east of Merida, this town offers a perfect excursion for anyone with a love for architecture and archaeology. As an excursion, you will take a bus ride to this town accompanied by a professional guide, who will narrate the history and culture of the place. Once at the town you will get to visit the Kinich Kamko pyramid at the center of the town. The largest and most famous pyramid in the northern region of Yucatan. This excursion will cost you anywhere from $100 per person if booked through a big tour company. Otherwise, you might get a good deal from local taxi drivers. Visit a real hacienda and marvel at the beautiful architecture, swim in a cenote, enjoy the tranquility of the place and have a delicious Mexican lunch. The hacienda is beautiful and has its own history to tell. Built over a hundred years ago, it used to be a busy farming center, that produced the famous fiber known as green gold. Take a tour of the main house and explore a mixture of architectural and furnishing beauty of the previous century. Stroll through the beautiful corridors made with shining tiles. Learn about the rope making days at the Hacienda, which was a manufacturing farm for henequen, a fiber extracted from the agave plant. That was used to make rope, handbags, rugs, sacks, and yarn. Travel back in time to the old good days at the place while riding on trucks pulled by mules, just like the old days. To finish the tour, visit the haciendas restaurant and indulge in a delicious sizable serving of Mexican cuisine. And if you have any time left, visit a nearby cenote and cool off before being taken back to the ship. Progreso is a port offering a real Mexican port experience. If you are expecting an over the top cruisers-targeted touristic port, then this is not it. What you can expect at Progreso, is historical and archeological beauty coupled with amazing people and culture. Carnival Cruise Line, Royal Caribbean, and Viking Cruises are some of the cruise lines that visit this port. If you would like to experience on a first-hand basis the beauty of the place described in this article, then visit any of those cruise company’s sites. And book a cruise to this underrated cruise port. Besides, it’s perfect for a winter getaway, as the weather always remains sunny all throughout the year. With occasional rains between June and October. Either way, enjoy yourself when you visit Progreso next. Happy Cruising! !